At the recent game in the FA Cup at Bournemouth if Lewis Dunk had played instead of Leon Balogun all the outfield players would have numbered 2 to 11 (thank you to Nick Szczepanik for a great spot!). Now when did that last happen? I don’t know and don’t have the time to find out but it prompted me to think who is Albion’s number 12? Answer, I think, is no one. In the current world of the Premier League, it is rare that the traditional numbers line up as players have a huge choice for the digits on their back. In years gone by of course those of us of a certain age will associate the number 12 as the sub, or in some cases, the ‘super sub’. My mind would probably turn straight to Liverpool’s David Fairclough. The distinctive ginger-haired substitute regularly made an impression coming off the bench. In those days you weren’t able to make the full three substitutions available to managers nowadays. Another player feted for his impact as a substitute is Ole Gunnar Solskjaer. Some may say that the defining moment of the career of the ‘baby-faced assassin’ was his last minute goal against Bayern Munich in the 1999 Champions League final. His role in a monumental comeback and historic treble will never be forgotten by Manchester United fans. It probably should be noted that he scored 125 other goals for the club. This week on the BBC Sussex Albion Unlimited podcast, Ronny from the Norwegian Seagulls group said fans were not impressed by his time as manager of Molde but everyone has to stand up and take note of his record as Manchester United boss. Six wins in six. Five in five in the Premier League. Three consecutive clean sheets. Three-plus goals in three games at home. The team is fundamentally the same but they now appear to have freedom to play their own game. In terms of substitutes he is in a position to call upon Lukaku or Sanchez. Not bad options to have. Things are different now with seven players to choose from. Sometimes it is about bringing on defensive players to sure things up to maintain a lead. Sometimes it is about bringing on offensive players to chase the game. 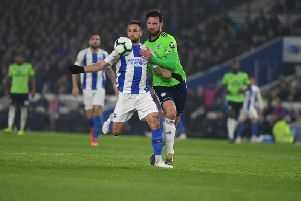 Albion manager Chris Hughton may not have Alireza Jahanbaksh or Jose Izquierdo at his disposal at the moment but he too has options off the bench. I think it is fair to say no player wants to be a substitute, a number 12, an impact player. Some take it with grace, others sulk and some knock on the manager’s door. In fact one of the hardest parts of the job of a Premier League manager in the current era is keeping everyone happy. It may be an impossible task to a certain extent. Of course it helps when you are winning. The squad tends to be happy and accept their fate if they aren’t included in the starting 11 while the team is on a hot streak. Many people felt the most difficult task ahead for Solskjaer was the trip to Wembley to face Tottenham last weekend. In reality it may be the challenge of handling the stars of the squad when results don’t go their way. He may have to decide who will be his trusted charges, who will be his ‘number 12’, his impact players. The accepted preferences are sometimes easier to accept at clubs lower down in the table but it is still a crucial part of the job, a part of the job that Chris Hughton currently appears very much in control of.